So, it's time to put the Jungfrau Marathon behind me (for this year anyway) and move on to my next objective, the OMM at the end of October, but before I do that I thought I'd wrap up by showing you what we got up to before leaving Switzerland. We were so lucky that the weather wasn't like this the day before as most of the race would have been below and in these clouds. As it was it was perfect for sight seeing. We climbed to the top of Mannlichen hill and enjoyed a 360 degree view of this sea of cotton wool just below our feet. As we watched the clouds on the Grindlewald side of the hills started to creep up towards us covering the route we intended to take down to Kleine Scheidegg. So, we walked down to Mannlichen again and into the clouds shown above. The route to KS was a nice broad path mostly sloping downhill. There were no views due to the cloud but it stayed reasonably warm. We came across one or two people wearing their JM finishers t-shirts so it wasn't just me who couldn't just take it easy after the race. In Kleine Scheidegg we bravely sat out in the cloud on the balcony at the Eigernordwand restaurant for lunch. I had one of their soups in which the bowl is actually a scooped-out loaf of bread. As I ate the soup I sliced of the top of the loaf and used that with the rest of the soup working my way down until it was all gone. Brilliant idea. No washing up. In KS they were dismantling the equipment from the race. The showers were all packed up and the barriers had been removed. The frame above the finish line was still there eerily emerging from the mist as we walked towards it. I couldn't resist running across the finish line for a second time. We then walked back along the race route. As we did the cloud below us cleared and we could at least see down into the valley if not up above us. Up to chocolate corner then through the dip to the top of the morraine, the highest point on the race at 2311m. Then it was down the morraine. It looked a lot steeper going down than coming up. I was impressed anyway. We could hear the glaciers off to our left cracking in the sun but couldn't see them. The contrast to the day before was especially noticably going down the morraine. No crowds, no bagpiper, no runners, no sun and no view. What a difference a day makes. I was very suprised at how little my legs seem to have suffered. When on the training week they said that it's the downhill running that makes the legs ache so much and they may be right but I'd have expected to be aching a lot more after all that effort. I attribute some of that to my relentless intake of fluids and energy foods during the race. So, we worked our way down the morraine to the cairns on the ridge above the Wixi. Where I topped off the highest cairn. Going down from here we noticed lots of litter from the race, mostly the tops from gels and gel packets so we started doing our bit and picked them up. As we got further down, just past the notorious bottleneck where I got held up, the barrier tape from the race hadn't been cleared and the litter increased so assuming someone was going to come back a clear up I tied our stack of litter in a neat pile in the tape. Just around the next bend there was tons of litter, mainly cups, and the 38.25km marker. Between this and the Wixi had been cleared of litter so they'd either decided to come back later and clear up or had abandoned it (I noticed from the train the next day that the tape and km sign were still there). After a walk down to the Wixi ski lift station and up to Wengenalp we left the race route and caught the train back to Wengen. The next day we were going home but as our flight wasn't until 21:50 we decided to squeeze in a trip up to the Jungfraujoch on the train. So, leaving our cases in the chalet it's back up to KS then get the Jungfraujoch train. This goes into the Eiger then doubles back up to the underground, and Europe's highest, station. On the way there are two stops. The first is to look through the windows stuck halfway up the north face of the Eiger. This is a unique opportunity to get a climber's eye view from the north face. Amazing. Unfortunately a photograph just can't take it all in. You have to be there. The second stop was on the other side of the Eiger and looked out over the Eismeer glacier with its housesized blocks of ice in a frozen cascade. You can also go out onto the snow (or rather ice, as it was compressed by tourists walking on it). I'm not sure it would pass health and safety checks in the UK as it sloped away in all directions and the only thing stopping you from sliding away into oblivion was a very dodgy looking rope fence. At 3500m the air is noticably thin up here. We had been told that, for some reason, Japanese tourists were particularly suseptible to the thin air and would regularly faint. Sure enough all the seats around the station were taken up by very weak looking Japanese tourists, many holding their heads in their hands. We then had a look round the Ice Palace carved into the glacier. We just had time to nip up to the Sphink observation platform (even higher than the station) before we had to dash back for a train down. 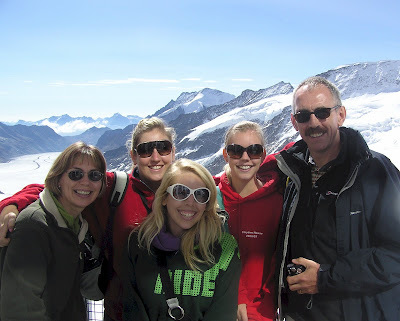 We didn't get time to see the huskies or walk across the snow to the Jungfraujoch hut and look down the Eismeer but we were were happy with our little excursion and glad to get back to thicker air. Picking up our bags we said goodbye to our wonderful apartment and set off home. If you ever want a holiday in this incredible region and fancy treating youselves then take a look at this place (http://www.chaletwengen.com/). Our apartment covered the left hand side of the first floor (where my girls are on the balcony above). So, after 11 months and many hundreds of miles of training, injuries, a not insignificant amount of expense from me and my marvellous sponsors and a large amount of sacrifice from my darling wife and daughters in putting up with my absences was it all worth it? Too bloody right it was. What a fantastic privilege to be free to do such a thing. I have some irreplacable memories, met some wonderful people and found out many things about myself and what makes me tick. It has been a voyage of discovery in many senses. Can't wait for the next one. Thanks for coming with me on this trip. Stay tuned for the next installment. Great to see you enjoyed yourselves, although it is a bit of a masochistic way to do it. Smart piccies, make me want to go and see for myself. Some of it looks bikeable-ish!